today we had our HEART WALK!! yeah! we have been really excited about this!! as a family, we raised about $400!!! WOWOWOWOWOWOWOW THANK YOU ALL!!! :) it was a BEAUTIFUL WALK!!!! really and truly WAS!! last year, the walk was REALLY SHORT AND BORING by just going up one street and coming right back down!! was not impressed! this year, WOW!! it was a GREAT WAY to explore downtown san antonio! we even went thru the KING WILLIAM DISTRICT and we walked on the RIVER WALK!!! very nice! it was cloudy and with a nice breeze! we had a GREAT TURNOUT with our friends and family! we had our sil, matthews OT and her boy, and 2 HEART FAMILES!!!!!! really nice! we missed a couple of heart families this year but GOD WILLING next year there will be MORE in our little family!!! well, here are some PICTURES!!! 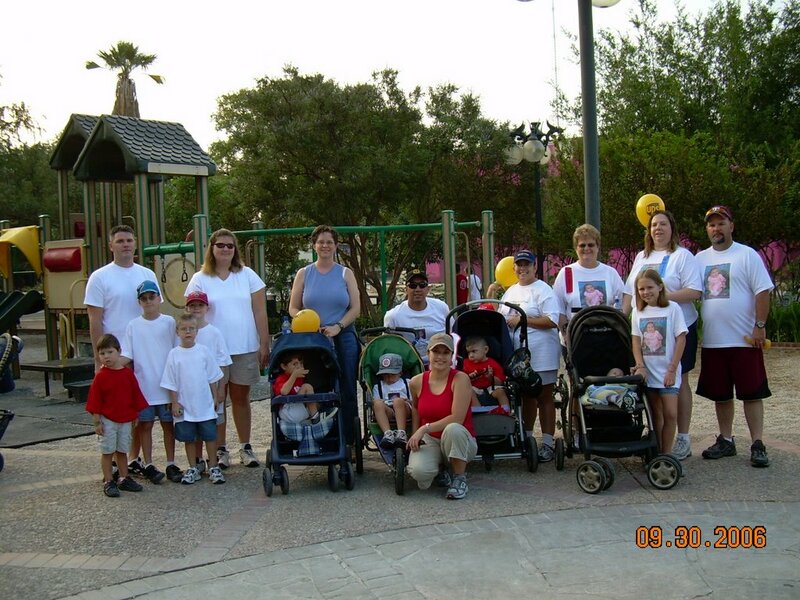 the first is of our family at the heart walk...and the 2nd one is ALL OUR HEART FAMILY AND FRIENDS! but anyway, that is that and we are OUT!!! so i am happy! and i got an AWESOME camera for my BIRTHDAY!!! :) thanks guys!!! YEP, we had a GREAT WEEK last week! james got a taste of how my week normally runs...he was really impressed at how MUCH goes into a NORMAL WEEK!! i think i only had one appt last week so it was an "easy" week! but he got a taste of it!! james was off for a week!! just us at home..it was very NICE!! anyway, we went to the RAIN FOREST CAFE........WOWOWOWOWOWOWOW!! that was soooo awesome! we really had a great dinner there and it was nice to be in that place! 3 stories of AWESOME stuff!! BEAUTIFUL! we can't wait to go back!! well, we are gearing up for the HEART WALK this coming weekend! wow, i can't believe this will be our 2ND heart walk! we didn't get to make the first one because matthew had just come home from the hospital! but GOD WILLING we will make all the others!! i am sooooo hoping that our little on line support group GROWS!!!! there are sooo many chd babies out there and so many parents that probably think they are the ONLY ONES or don't know anyone and we are RIGHT THERE!!!!! GOD WILLING the word will go out!!! 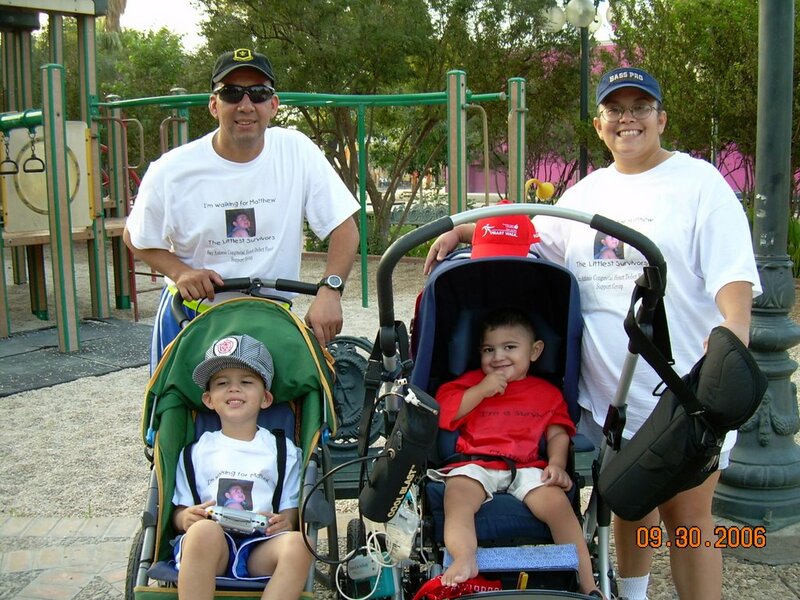 HONORING MATTHEW ISAIAH AT THE HEART WALK..
My son's name is MATTHEW ISAIAH….he was born MAY 21, 2004 in San Antonio . He was born with a rare CONGENITAL HEART DEFECT (CHD) called Total Anomalous Pulmonary Venous Return(TAPVR). I didn’t think that my son would have anything wrong with him when he was born. I had a GREAT pregnancy and I did everything “right” during it, so I had NO reason to believe that my child would ever have a CHANCE of having anything wrong with his heart. I did all the test, EVERYTHING but I was very wrong. 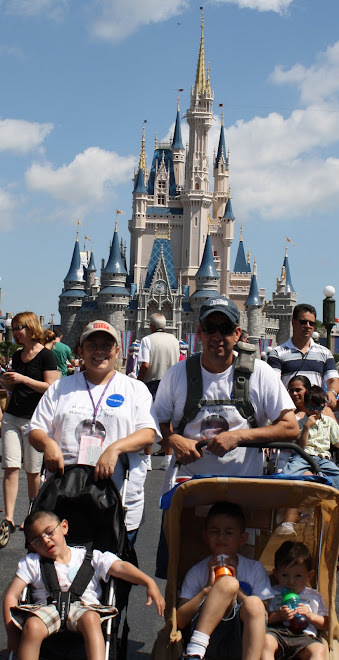 We were unprepared for this diagnosis and we were THROWN into the world of having a HEART BABY and a with that a SPECIAL NEEDS CHILD really quickly and with no CHANCE of looking back and changing things. This is how QUICKLY things can change in a persons life. Whether it is a CHD or a stroke or heart attack, things happen without warning. The AMERICAN HEART ASSOCIATION (AHA) does research for all heart related disorders. If you would like to make an ONLINE DONATION, please click on this LINK and it will take you to my donation webpage. There is a space to 'ENTER YOUR DONATION HERE" area and then you do and click "CONTINUE" and it will take you to where you need to go! You just have to enter the information on line. It is SECURE but you have to make at LEAST a $25 donation to do it on line. I THANK YOU IN ADVANCE for any and ALL donations!! i don't know WHAT HAS HAPPEN in the last 4 months!! he had NOT had many seizures or any AL ALL since aug 2005 and then BAMMMMMMMMMM....what HAPPENED?! i am worried because he had done SOOOOO WELL!!!!!!! then all the sudden he started to get them TONS! now if i go with the DEVELOPMENTAL part that he is developing so he is now jump starting those areas and that is why he is getting these seizures....ok but if NOT, then what?!?!?!?!! anyway, we will keep a VERY CLOSE EYE on him now until the surgery....i just feel that this is going to be a TOUGH MONTH!! BUT, after his seizure, he DID go and play in the ocean!!! he had his LITTLE TOES and hands and was just spashing away and SCREAMING!! he was soooo happy! and we plan to get them into the swiming pool as soon as they wake up!!! :) SHOULD BE FUN!! we are goingto make the MOST of this vacation......please PRAY FOR HIM!!! today, we had another seizure....yep, it happen and i had a FEELING it WOULD happen...during his bed time on monday night, his HR went into the 50's so i told james, "get ready!" but nothing happen durning tues nap...well on tues bed time, his HR was ALL OVER THE PLACE again!!! (50's - 120') and then today during nap, it happened....i knew it might happen......he drifted off right away and i watched him for about 5 mins of sooo....nothing happene....came downstairs and was intently watching the monitor....i turned away cause i was working on alex computer when i heard something OFF and i quickly glanced over and i saw his lips moving and i jumped up and RAN up the stairs....he was having a full seizure (facial and legs), so i tried to wake him up and told him "matthew, i am going to put some oxygen on you" (he HATES when you put the cannula on him) and he started to whimper, when i actually put it on, he woke up and started to CRY (he was still seizing) and i just told him, "i am going to have to suction you since you are having your seizure" again, he HATES the suction machine and he was just crying.....i was timing it....and then i just kept up my talk to him of what i was going to do since he was seizing and after i shut off the suction machine, he had STOPPED SEIZING!!! :) i guess i need to threaten him more often on the things he HATES!!! he was FINE!!! when i woke him up about an 1.5 hour later for therapy, he was REALLY wobbly and jerky but he was fine...poor baby!!! BUT THANK GOD HE STOPPED!! got myself an awesome new song!! just playing around but i just LOVE LOVE LOVE this song, as james can tell you when we go to the club!!! :) brings back my HIGH SCHOOL YEARS!!! and L, I KNOW YOU READ THIS, SO GO AHEAD AND DANCE!!! :) WOOOOOHOOOOO!! ENJOY! we have had a BUSY week!!! yes, it has been a LITTLE HECTIC!!! SAT....matthew is a bit better......STILL CONGESTED and needing oxygen but he is actually wanting to PLAY now....he is still not tolerating his feeds but ALMOST.....sad thing, all that progress he made with ORAL FEEDS.....gone......gone....gone......so fustrating!!! he does so well and then BAMMMMMMMM....he gets sick......GOD WILLING he will start all over again and get back to where he WANTED to eat and was EATING WILLINGLY!! can anyone understand that? i have been thinking of this for a while now. i use to LOVE when my boys fell asleep....they looked sooooo peaceful, so comfy....it was such a JOY to see them just relaxing....well, since MAY 2006, that has been taken away from me with matthew....i DREAD for him to do something as simple as SLEEP!!! i know he NEEDS it and now with his increased doses of his SEIZURE meds, he is always REALLY SLEEPY and TIRED and will SLEEP......OUR ENEMY!! matthews seizure happen when he is ASLEEP....so, NAP TIME, is such a TRYING time....when he goes to sleep, we are on WATCH until the moment he wakes UP!!! many people felt the same way when their kiddos where INFANTS and were afraid of SIDS and that usually goes away when they get older....well, we just restarted that phase....for us, no NAP TIME and no SLEEP TIME is safe for matthew......i am thankful, in an odd sort of way, that his seizure DO happen when he is asleep because then they don't happen just ANYTIME.....you know? that is wierd but it is true! hello everyon!! !first, THANK YOU SOOOOOOOOOO MUCH for all the PRAYERS and THOUGHTS for matthew isaiah and our family.....it means SOOOOOO MUCH to know that ya'll were and to read all the responses to my email and on my different forums....THANK YOU!!!!! i get really teary eyed when i read them!!! THANK YOU! well, matthew got out of the hospital TODAY, yes LABOR DAY!!! he was in there for 3 days and 2 nights! matthew got out of PICU on sunday late afternoon and we were moved to a GREAT room on the 6th floor. this room was a FAMILY ROOM! very nice! we had already checked out of the HOTEL room on sunday morning right outside of houston and we were going to have to find another hotel somewhere on galveston and the prices there are PRETTY HIGH especially with the holiday....so, although we were suppose to go to the 5TH floor (chronically ill floor) they moved us up to the 6th into a room where we could ALL STAY!!!! how nice was THAT?! so, we got to spend the night in the room together! very nice! and THANK GOD we were together again! it was nice because they even sent a nurse from the 5th floor to take care ol matthew and his doctors were all from the 5th floor! anyway, they basically took him off his seizure meds and put him on Fosphenytoin (Cerebyx®) via IV....they didn't restart his meds until sunday EVENING for his 9pm meds!!! i had to ask the dr since they were going to release us on monday, don't we need to start his home meds again, or whatever meds they were going to send us home with? but, they finally called our regular neuro and he advised them to go up on his ZONEGRAN to 300mg (we just went up a week ago on friday!!) and now he is at his MAX on ALL HIS MEDS!!! that is it, they can not go any higher so i am anxious to talk to the people on friday about the VNS! I JUST PRAY that is an answer to his seizures!!!!!! anyway, they also had him on an IV antibiotic up until this morning because they were afraid that he aspirated when he had his seizure....still not sure if he did or not but now he is junky because...........HE AND ALEX CAUGHT SOMETHING WHILE THEY WERE AT THE HOSPITAL!!!! yes, we just had to bring home a soulviner with us and of course pass it along to ME too!!! share and share alike i always say! alex sounds worst! he is coughing and has congested and has a running nose.....and OF COURSE, matthew could not just leave the hospital without causeing his own little STIR.....sunday night, when the nurse was taking his temp and getting his b/p he had a MAJOR FIT and was crying and holding his breath soooooooooooooooooooooooooooooooooooooooooooooo much that he basically PASSED OUT!!! i had him on my home pulse ox because it was time for sleep and the nurse came in and he just lost it and held his breath....he would NOT LET UP!! i threw water on him, blew on his face, sat him up, pounded on him NOTHING WORKED! IT SCARED THE ***** OUT OF ME, JAMES AND THE NURSE! his o2 sats went into the 40's-50's!!!! he finally wheezed a breath in when he just about passed out! he was sooooooooo blue!!! very scary! the nurse FREAKED OUT! i was really upset and told matthew, "you can't do that!!!" of course he was like WHATEVE MOM! the nurse actually called the drs in so they could check on him and talk to us! makeing sure this was "normal" i told them, unfortunatly YES but that was the first time he held it soooo long! anyway, i talked to the discharging doctorS (there was the faculty plus 3 other drs) and she was really excited to meet matthew. she had yet to meet him but she had heard alot about him and his family from the other drs! they were really impressed with how great he was and also how well behaved alex was!!! they really liked my history sheets on matthew (8 sheets about EVERYTHING matthew has gone thru!) and she was just really nice! she said that the other drs and nurses in PICU were just gushing about us.....AWWWWW....made me cry!! anyway, she said that he looked good and that she hoped that the VNS was the answer too. she agreed with us that we should NOT keep matthew at home!!! she said that was RIDICULOUS! we know what we need to do if something happens and she said that we did such a great job, she felt all would be well!! she said, IF IT HAPPENS AGAIN WHILE YOU ARE OUT, THER IS HELP NEARBY!!! JUST MEANS YOU HAVE TO MAKE A SIDE TRIP TO THE HOSPITAL!! !i soooo agree!! and just to clarify something, it was someone we know that told us that we should stay home with him and not take him out....of course, that is NOT AN OPTION! nothing we do CAUSES him to have a seizure....they are going to happen whether we are AT HOME or OUT AND ABOUT!!! we just have to be prepared! we carry oxygen in the car and a pulse ox monitor on us and the DIASTAT....and when we travel, i carry a suction machine, oxygen, pulse ox and of course the DIASTAT....i will not be afraid to take my baby whereever. now of course, there are SOMEPLACES i don't take him too, where there are no facilities near by or where the temp is too hot etc....but to see matthew EXCITED and HAPPY, it is just such a BLESSING to see him ALIVE! i just won't keep him locked away at home! i do try to keep him away from germs as much as possible but you know, who wouldn't? anyway, we are a FAMILY that loves to be together......soooo, onto this week. i have to make an appt with his neuro tomorrow and see what he has to say! i know he kidded with us when i talked to him and he said not to stop at any red lights on our way HOME!!! alex has his important ORTHOPEDICS drs appt on wed for his hips! i just PRAY all will be ok!!! and then on FRIDAY we have our VNS appt....and did i mention james is leaving for a couple of days...?? soooo, we are HOME and we are HAPPY and matthew is doing well! thank you to all that thought of him and said a prayer! he is our STRONG LITTLE BOY and we are sooooooo proud of him! when we got out of the hospital, we took a TROLLEY ride that went around galveston...wow, we are DEFINETLY going back there AGAIN! it is such a BEAUTIFUL OLD historic town!!! and then when we come back, we are going to the KEMAH BOARDWALK! it looked like fun! there was also the RAILROAD MEUSEM there in galveston but we were unable to make it out there! james and alex got to do some FISHING while we were there! i am soooooooo happy they got to do that! soooo...wer are HOME, THANK YOU GOD and we are as always on alert with mr matthew. we are also going to be talking to the MDCP worker on wed and i am talking to his PEDI about night nursing......GOD WILLING all will fall in place!!! thanks again! everyone's words of encouragement and support ALWAYS help me and my family to be stronger! those little words LIFT ME AND MINE UP! thanks you! take care everyone and GOD WILLING there will be at least a LONG WHILE before we have anymore of this drama!!! thanks again! MATTHEW ISAIAH......on vacation in PICU! well, we are leaving here by 7am and heading over to the hospital...we can start seeing him by 8am so we want to be there then. last night, his HEART RATE was all over the place (40's up to 110's) so last night i even told james, "hmmmm...i wonder how we call 911 from the hotel?!" i think we have figured it out that when his HR goes down into the 40's & 50's that means that he is getting ready to have a SIEZURE....dr T. said that that could be his AUTONOMIC RESPONSE and that is now our clue when he will have a seizure.....glad to know it! i tell you, i have been playing detective trying to find a way to know WHEN he is going to have the seizure and since we started to monitor his HR and pulse ox, his HR went into the 30's & 40's right before his 8/2 big siezure and then when he had a smaller one, 8/25, earlier that day during nap, his HR went into the 40's & 50's and then he had a seizure and then this time it did it again!!! last night it did it and then today during nap he had his sieuzre!!!!! isn't that wild?!?! the things that i keep track off, huh?! THANK GOD i did!!!!!!!!!!! at least we have a BETTER idea when it MIGHT happen, right? someone told me that we SHOULDN'T be taking him out and about.............man, that made me upset!!! we can't keep these kiddos locked up and not going anywhere just be cause he MIGHT have a seizure!!!!!!! can you imagine that? would you like your kid not to be able to ENJOY life and EXPERIENCE life?! i want my baby to do that and soooooooooo much more!!! nothing we are doing CAUSES him to have a seizure...that is unfortunatly part of his life now!! i refuse to keep him PRISONER in our home for FEAR that he is going to have a seizure or something if we leave there! i don't want to do that to him!!!!!!! he was having soooooooooooo much funr on the trip!! he LOVES going places and gets sooooo excited getting out of that house! he loves being with us as a family! i refuse to leave him out just for FEAR!!!!! ANYWAY, any thoughts and prayer for his quick recovery would be appreciated. we are going to be going to talk to a man on FRIDAY about the VNS (vagal nerve stimulator) procedure.......that MIGHT help him out since meds don't seem to be working...PLEASE PRAY that that is the ANSWER and that he does well with it and it helps him to be off of drugs and not having any more seizures!!! thank you soooo much for all thought and prayers....poor little one is alone right now but i know he is doing well.......i know he misses us and we sure do miss HIM!!!! anyway, please please pray he is doing well and will come home tomorrow!! somehow, they have different rules here and MIGHT keep him longer.....i sure HOPE NOT!!! :) he seems to be back to his old self!!! :) my little stinker!! we are going on a MINI VACATION!!! yippeee!! i am excited to be going SOMEWHERE for a bit! james and i and the boys are going over to GALVESTON for a couple of days! we hope to go the BEACH, FISHING, and there is a RAILROAD MEUSEM there we want to take alex to! we also heard about the KEMAH boardwalk and that sounds interesting!!! anyway, we go with knowing that james dad just got out of surgery on thursday but we are going with his mom's blessing! we NEEDED this time away as a family! we LOVE to travel! just enjoy ourselves!